I’m in the market for new safety/steel/composite toe shoes, and was wondering which Shoe is best for standing on concrete all day. 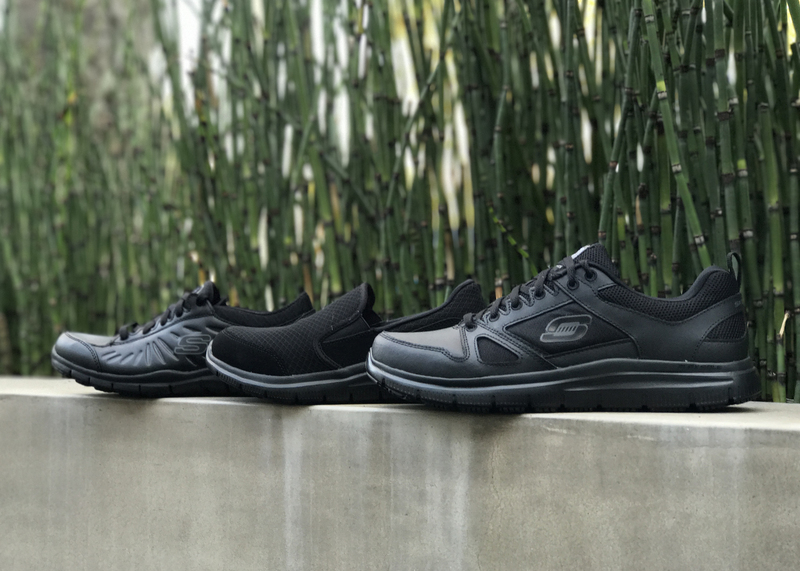 The sketchers I have right now are nice and lightweight, alloy tip ones, but my feet ache after I take them off at night. I find it hard to walk after work, my heels are in lots of pain. So any suggestion on a safety toe shoe that’s lightweight and meant to be on concrete all day would be appreciated. I’m very disappointed that Skechers has decided to no longer sell Skechers for Work Shape Ups Exeter Men Work Shoe, This work shoe was a great knee saver for a large frame guy who stands 10 to 14 hours per day in the kitchen. I’m sure that i’m not the only person that feels this way. Hi Orlando! We are looking into bringing them back, and your comment will be used for that purpose as we will bring it to upper management :). However, in the meantime- of the currently available men’s Work shoes I recommend the Burst SR for lots of standing and walking – it’s got very good cushioning and support! Have a great day! hello ….. i also stand on my feet all day, and you have soo many different designs. i’m not sure which one would work best for being on my feet 8 – 15 hours (i’m a flagger ). i don’t need a steel toe and have wide feet …. can you narrow my search down any??? I just took delivery of my Sketchers Surren, Steel toe, waterproof, relaxed fit work boots. Just like my other Sketchers shoes they are very comfortable. However, they seem too stiff around the ankle. I’m hoping once they are broken in this problem will lessen. I did wear them around the house before going outdoors with the hope of breaking them in. I work in a MI lumber yard & they’ve already been exposed to all the cold weather elements.It’s been 2 weeks but they still seem a little stiff around the ankle.